The National Climate Assessment, issued this week by a team of government researchers, minced no words about the impacts of climate change: You’re feeling them now. Since records began being kept in 1895, according to the report, the average temperature in the U.S. has risen by 1.3 to 1.9 degrees Fahrenheit, with most of that increase occurring since about 1970. The most recent decade was the nation’s warmest on record, and 2012 was the warmest year on record for the lower 48 states. While the entire country is predicted to eventually warm anywhere from 3 to 5 degrees Fahrenheit by the end of the century, that warming will be neither linear nor uniform. 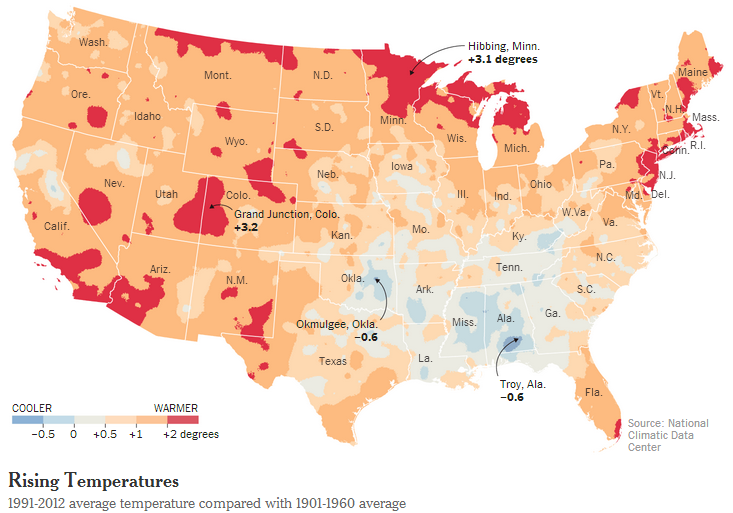 The map above, created by The New York Times based on data in the climate assessment, shows that different regions of the country already have warmed at different rates. The upper Midwest and Alaska, which already have experienced some of the greatest temperature increases, are projected to continue warming more than the rest of the country. Nonetheless, Americans are relatively unconcerned about climate disruption compared with other people around the world. In a 39-country survey conducted by the Pew Research Center last year, 40% of Americans called global climate change a “major threat” — lower than all but six other publics (China, the Czech Republic, Jordan, Israel, Egypt and Pakistan) in the survey. More troubling to Americans were North Korea’s nuclear program (59% called it a major threat), Islamic extremist groups (56%) and Iran’s nuclear program (54%).